The President of the Christian Association of Nigeria (CAN), Mr Ayo Oristejafor, has urged the Federal Government to dissolve the committee constituted on granting amnesty to Boko Haram insurgents. Oritsejafor’s reaction, contained in a statement in Abuja on Wednesday and signed by his media aide, Mr Kenny Ashaka, also commended government for declaring emergency rule in Borno, Yobe and Adamawa. He said the committee, tagged “the Presidential Committee on Dialogue and Peaceful Resolution of Security Challenges in the North’’, was no longer relevant, following government’s decision. The News Agency of Nigeria (NAN) reports that the committee, headed by Mr Kabiru Turaki, was set up to design a plan for granting amnesty to the Boko Haram sect. Oritsejafor said that government’s decision to explore a more intensive military action to end the insurgeny was a vindication of CAN’s stand that amnesty for the sect’s members was not a solution. “With the declaration of a state of emergency in the three states, the amnesty committee is no longer relevant and should be dissolved. Government should suspend the amnesty committee. “The declaration of a state of emergency in three north-east states is a justified action and a vindication of CAN’s position that negotiation with terrorists will always end up a futile exercise. “We are being vindicated that no reasonable agreement can be reached with terrorists,’’ the statement quoted the CAN president as saying. It stated that President Goodluck Jonathan deserved commendation for the resolve to adopt a measure that would bring an end to the bloodshed in parts of the North-East. The statement further expressed CAN’s support for the kind of emergency rule adopted by the Federal Government. It described Jonathan as a “true democrat and an advocate of human rights protection’’. 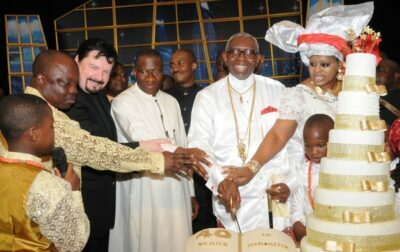 Oritsejafor, the statement said, called on political leaders in and outside the affected states to reciprocate Jonathan’s gesture by co-operating with security forces to end the mayhem. “While saying that the state of emergency declared in the three states is not unexpected, CAN calls on the three concerned governors to reciprocate the kind gesture by co-operating with those charged with the responsibility of bringing down the insurgency,’’ it stated. Nigerian President Goodluck Jonathan, in a nationwide broadcast on Tuesday, declared a state of emergency in Borno, Yobe and Adamawa.